I'm in France right now, for a relatively quick trip. Or, another way to think of it, a quick trip flanked by two long flights. I took it as an opportunity to up my dumpling game, making and freezing an assortment of them in the weeks leading up to my trip. It made it easy to leave some for Wayne to enjoy while I was gone, and to pack a box, bento-style, for my flight. Dumplings at 30,000 feet are a treat, and worth the effort - filling, nutritious, plane-friendly finger food. Here's the wildcard. This time I made my own dumpling wrappers. It's only about half as crazy as it sounds. 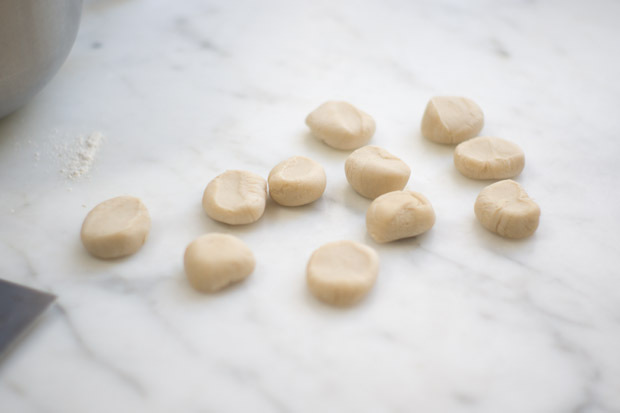 In reality, making your own wrappers is very similar to making fresh pasta (not difficult), and equally satisfying. So, I thought I'd share the basic jist of what I did to make momos - or what I think of as Himalayan dumplings. Little poufs are stuffed with a ricotta cheese base mixed with chopped cabbage, spinach, ginger, chiles, cumin, scallions, and the like. Andrea Nguyen is the angel that sits on my shoulder anytime I attempt dumplings. I keep her book on the counter and her voice in my head. 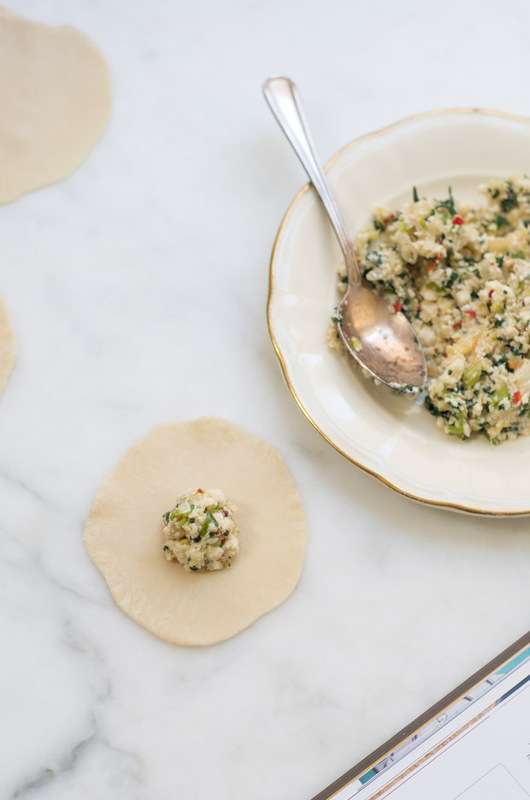 We made dumplings with homemade wrappers together years ago, and I was by no means a natural. She assured me, even ugly dumplings are usually fine once cooked. And she's right! ;) I used Andrea's framework for the filling, but switched up the ratios and technique a bit, based on what I had around the kitchen. 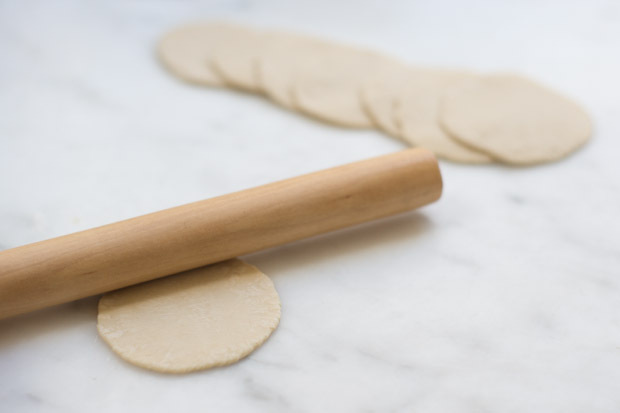 A few suggestions if you're a dumpling beginner: Start by using pre-made wrappers before graduating to homemade, allowing you to focus on folding technique. Start with simple folds - like half moons or big hugs before graduating to more complex shapes like the momo. This was my first attempt momo-folding. Not perfect, but delicious! As far as fillings are concerned, it can be helpful to make them a day or two ahead of time. Once you've nailed your filling, and are confident in your folding, then consider making the jump to homemade wrappers. It's absolutely worth the effort, and you'll likely swear off pre-made. The last thing I'll mention about making your own wrappers is that it enables you to boost the wrappers with color, flavor, and ingredients - for ex: turmeric, or other spices. Or juices - beet, spinach, ginger, etc. Bring a pot of water to a boil. Salt the water a bit, add the cabbage, cook for about 30 seconds, add the spinach and cook for another 10 seconds or so - just long enough for everything to wilt. Drain, rinse with cold water, and press out any extra moisture with a clean towel - really go for it. Heat the ghee (or butter) in a large skillet over medium heat. Stir in the onion and cook until soft and translucent - a couple of minutes. Stir in the garlic, ginger, red pepper, and red chile flakes. Cook for another minute or so, then stir in the cumin. Add the cabbage mixture and cook until heated through. Stir in the cheese, scallions, and cilantro. Stir well, then sprinkle in the salt. Give your cornstarch mixture a quick stir, drizzle it across the pan, and stir well, until everything comes together. Set aside to cool before proceeding to use in dumplings. If you're ready to make dumplings, either follow the instructions on the wrapper package, or fold them and seal them into your desired shape. 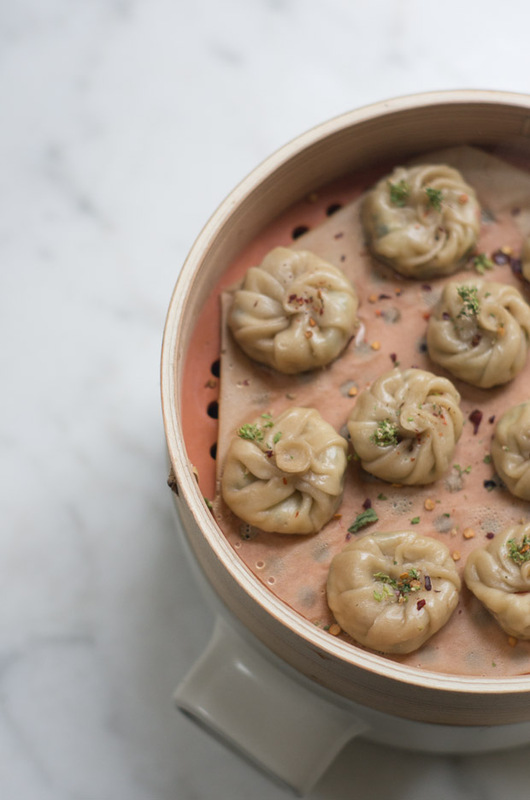 You can use a basic shape like half moon fold, or attempt a more elaborate fold (like the momo) before steaming in a lined steamer for 7-10 minutes. Makes 2-3 cups of dumpling filling.